In 2016 FORUM-ASIA elected a new Executive Committee. With its appointment, a new Chair, a new Vice-Chair and a new Treasurer were also chosen. Last e-newsletter we featured a short interview with our new Chair. This time we talked to our new Vice-Chair Rafendi Djamin. Rafendi has just been appointed as the first Director of the Amnesty International South East Asia and the Pacific Regional Office, staring from 1 April 2016. Rafendi has been advocating for human rights, democracy and humanitarian issues in Indonesia, lobbying inter-governmental bodies and the UN human rights mechanisms for more than twenty years, among them through the Human Rights Working Group, the Solidarity for Asian People’s Advocacy Task Force on ASEAN and Human Rights and most recently as the first ever Indonesian Representative to the ASEAN Inter Governmental Commission on Human Right (AICHR) from 2009 to 2015. The following interview is based on a conversation we had with Rafendi in March 2016 in Bangkok, Thailand. As he was preparing for a new phase in his career, we asked him about what had motivated him in the first place to become a human rights defender, and how his commitment might have or have not changed over the years. What motivates you? How did you become a human rights defender? I became involved because I myself was a victim of human rights violations. I was arrested and put in detention because of my activities, which was only speaking up, expressing my freedom of expression. When I was a student activist, we organised a seminar. The event was deemed a threat by the then Government, because one of the speakers was a recently released political prisoner, who had been incarcerated for questioning the 1965 massacre. As a student you want to learn about your history, about the truth about what happened in your country. In our case that concerned the very recent history in Indonesia. So that was the beginning. I, together with four of my friends from the student union, was arrested, interrogated, released, arrested again, and so on. I do not come from a particularly poor background. My family was middle class. My father was even an officer in the Navy. But none of this mattered in the time of Suharto. Eventually we were released after in total some 4-6 month. And that is when my commitment really started. I started to feel that what had happened was wrong. How was it possible that I was arrested? It could have happened to everyone. It could even happen to me again. And that is when my commitment started. And has that commitment changed over the years? No, it has not changed. But with time, my commitment is getting stronger and stronger. When I was eventually released I had not finished my studies. So I had to look both for a scholarship and a school abroad to continue learning. After one year of uncertainty, one by one all four of us received scholarships. One of us went to the USA, and three of us went to the Netherlands. So that is how I started my international activism, in the Netherlands. It was difficult to figure out how to continue to be involved so far away from the country. What could I do? How could I use the opportunity of being so far away from the threat of the military? How could I have an impact as a human rights activist on the struggle my friends were still facing in Indonesia? So I continued to work, continued to be active. I tried to link up with support groups in the Netherlands, groups of Dutch people who were sympathetic with the struggle of the Indonesian people. I also got in touch with asylum seekers from Indonesia, many whom were based in Europe. These were people who had been forced to flee from Indonesia after the political changes in 1965. All of this led me to become involved with international advocacy. I supported the presence of Indonesian activists in Geneva. This helped the further strengthening of my commitment, of my motivation. After several years I came back to Indonesia. This had never been an issue. I had the freedom to go back and forth to the country. I used this to maintain, develop and strengthen the cooperation with various human rights organisations in Indonesia. I was able support them to increase their capacity, to guide them in their Geneva advocacy, and to raise the voice of the victims of human rights, and of human rights defenders. 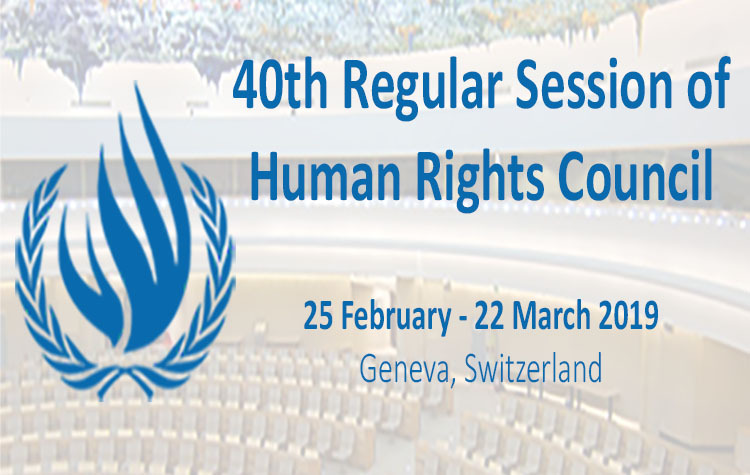 From having been an activist for a long time, you became involved with the AICHR. How did that change your own motivation or commitment as a human rights activist? The political space in Indonesia has changed after 1998, after Suharto fell, after he was forced to step down. This started a process of democratisation. It also meant that the human rights movement needed to adjust itself in terms of strategies and tactics, according to working in a much more like-minded environment. Obviously there are still remnants of the old regime, but there is a serious process of democratisation. Together with the changes in the political environment in Indonesia, changes came in how the country conducted itself regionally, more in-line with the regional solidarity of human rights defenders such as FORUM-ASIA. Through ASEAN, as an inter-governmental body, these changes in the policies of the Indonesian Government were starting to become more evident. They were opening up a bit, including being more open to human rights language. It does not mean we do not have human rights problem. Human rights problems are still there. But there is another range of responsibilities, as a democratic country in the region, to really try to support democratic processes in other Member States of ASEAN. It is within that context that I became to represent the Indonesian Government, and the Indonesian people, as well as the human rights community, in the ASEAN Inter-Governmental Commission of Human Rights (AICHR). You will be taken on the role of the first Director of the Amnesty International Regional Office of South East Asia and the Pacific on 1st April 2016. A new step which, if you want, will require you to take on a new perspective. Having been very focused initially on Indonesia and on ASEAN, you will now focus much more broadly, how do you think this will change your perspective? I do not believe that it will change my perspective, I will continue to have the same perspective, but obviously the scope will change. Not only will I be working on the entire region of Southeast Asia, including Timor Leste, but also on the Pacific Islands States. In total there are more than 20 of them. Some are very problematic when it comes to human rights, and some are not. But in general there is a deficit of democracy in the whole region of Asia Pacific, and, of course, with that come widespread human rights challenges. So that is going to be a very challenging task for me. I will try to remain involved with FORUM-ASIA. My organisation, the Human Rights Working Group (HRWG) is a member of FORUM-ASIA. I will remain as a senior advisor of HRWG, so in that manner I believe I can remain member of the Executive Committee of FORUM-ASIA. I just started with the function of Vice Chairperson, and I would like to continue to contribute to FORUM-ASIA. In closing, in all of those different stages in your career, in your life, what has been the main belief that has kept you going? Whatever you do, no matter how slow the change might be you need to believe that you are making a difference. It is this change that motivates you, and strengthens your commitment. Of course, sometimes you get tired. But you need to believe that eventually change is going to come, and that what you are doing will never be a waste.